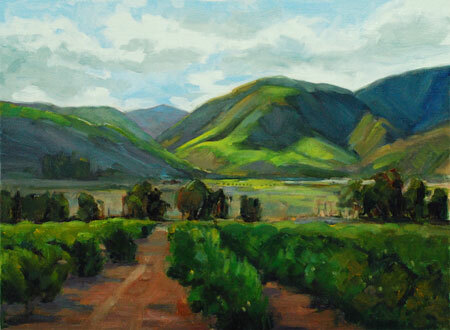 Through the years, some of our most enjoyable travels have been along the many backroads that criss cross California. This small road goes inland from Cayucos, just a little north of Morro Bay. Closer to the water, the marine layer softens all the edges. The fog is soft and gray. As we drive inland, the fog burns off and takes on other colors. There are many orange and avocado groves along these country roads, which proves that the area does not often get frost. But it is hot as blazes in the summer. 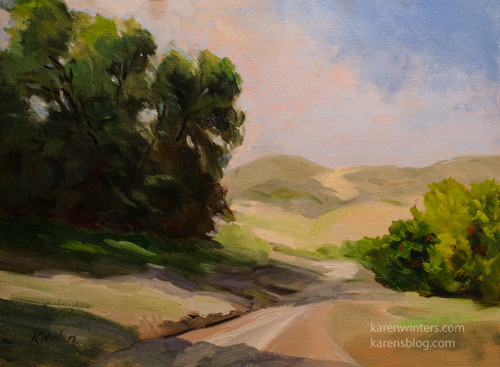 We will commonly see eucalyptus trees used as windbreaks to protect orange groves, but along this road the California live oak trees were doing the job. Location: Santa Paula Art Museum, Santa Paula. 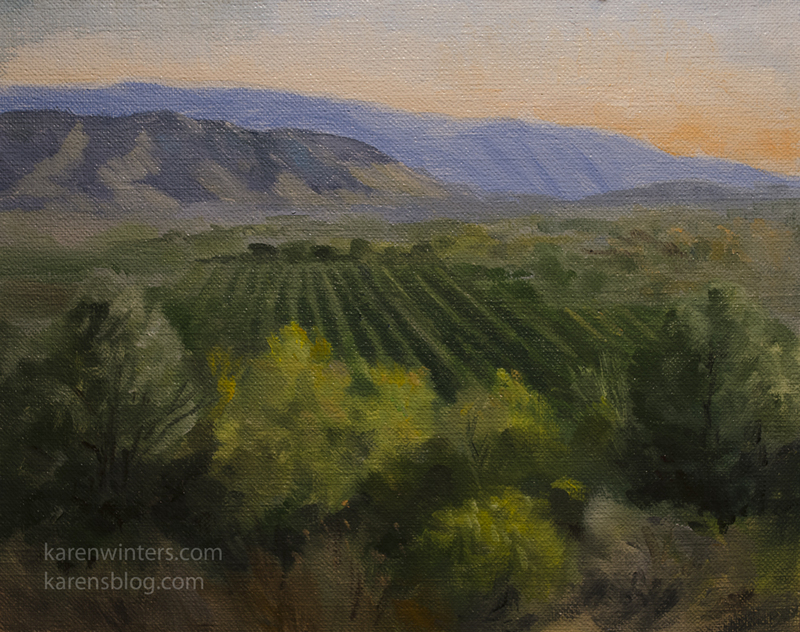 I painted this scene of a wonderful area along highway 126 – in the Santa Clara River Valley. This agriculturally rich area is probably what the San Fernando and other regional valleys were like a hundred years ago. But I’m just guessing at that. 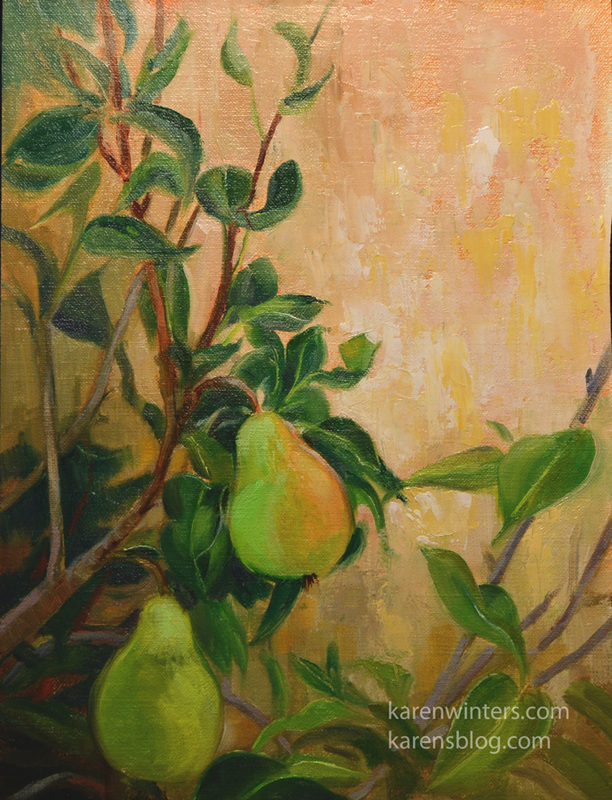 Avocados, citrus as well as row crops are abundant, and in the springtime the colors are rich. My objective in this painting was to capture the feeling of velvety green on the distant hills where the light broke through the clearing storm clouds.